Getting around in Prague is really easy. Most places are within walking distance and the public transportation is simply amazing. But it can be a bit confusing as well. When I first arrived in the city, I didn’t quite grasp how this ticket system works. I was used to paying to get on the subway, bus or tram and then get off where I needed. Not so here in Prague. Here, the tickets are by time. My first question… what the heck with that?! Where I am from, we are lucky if the bus is only 5 minutes late. I could go broke with this system! 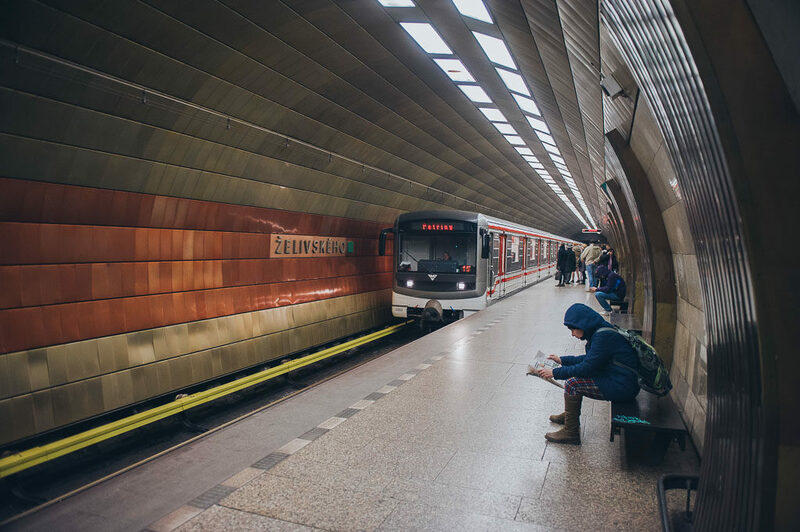 This blog is here to take the worry out of public transportation because I did all the worrying for you. First off, the transportation system is very efficient and on time. I was on a bus where the driver was a bit ahead of schedule, so he sat at a stop checking his watch until he was back on time. If the clock in the metro says the train will arrive in 3 minutes and 14 seconds the doors will be opening then. This makes the time “thing” much easier. Second, most places are within 30 minutes. That is a 24 CZK ticket – a bit over a US dollar or the cost of 1 euro. Not a bad price. Longer times are available as well for a bit more. I suggest the 90-minute ones for 32 CZK if you feel like taking a tram to ride around and see Prague. I sometimes ride a tram just to see parts of the city that I do not frequent. Again, 90 minutes each way and you can see much of the city. You can also buy a one-day pass for 110 CZK. To be clear, you have 24 hours from the time on the stamp. A 3-day pass is available, too, for 310 CZK. You get the idea. If you are staying a while, monthly and yearly coupons are also an option. So, how to get a hold of one? There are plenty of ways to acquire a ticket. Some hotels and hostels even sell them at their reception desks. That is where you should start, and if you are not that lucky, don’t worry. In the vestibule of the metro and next to tram stops, there is usually a yellow machine where you can buy them. While most of these take Czech change only, the city is adding new ones where you can pay by card as well. Nevertheless, it is always good to have some change on you, if not for the ticket machine, then for public restrooms or to avoid frowns from moody vendors. Another option to buy a ticket is tobacco shops that sell magazines. These can often be found near tram stops or in the metro. You can also receive the ticket via an SMS – just send DPT24, DPT32 or DPT110 (depending on the price of your chosen ticket) to the following number: 00420 902 06. While this might seem like the easiest option, you might encounter some problems due to your foreign sim card, so I do not recommend that. Some of the newer trams also offer the option of buying the ticket directly inside, with a card. But that is only a recent invention and you should not rely on this. Finally, since Prague is a progressive city, you can now also buy tickets via an app called PID Lítačka. The app has a built-in map of the transportation system and it allows you to search for the fastest connection. For those of you who prefer to stay online on your trips, this is definitely the best choice. Now that you have the ticket in hand, you are ready to commute. In the photo, you see a sample of the tickets. You want to have them stamped on the side that sort of looks like an arrow. If you are taking the metro, you will find yellow validators at the top of the escalator. Be warned, sometimes there are ticket inspectors waiting at the beginning of the platform, so if you are on the escalator and you have not stamped your ticket yet, it might be too late. Make sure to stamp the ticket only once. If you have a day pass, it is for 24 hours after the stamp. The yellow validators are found inside the trams and buses. If you bought the ticket via the app, you can activate it online. It is very important not to lose the tickets; the transportation service checks for them. On occasion, a person with a badge will ask to see your ticket. If you do not have it or it is expired, there will be an 800 CZK fine. You will also be fined if the ticket is stamped more than once. Here is how I have seen this work: After a tour, a couple was going to the same area of town that I lived in. We decided to ride together to continue the conversation we were having. The revizor (as they are called here) checked us while riding the metro and unfortunately they had forgotten their day pass. This revizor could speak some English and asked them what station they were going to. He then rode with us to their station where we all got off and went to the nearest ATM. After they withdrew their money and paid the fine, he gave them each a 90-minute ticket. This allows a person to continue on their route. As a point of interest, you will find that many of the metro stations are very deep. In fact, Prague boasts the deepest metro station in Europe. Náměstí Míru is 53 meters below the surface. This means it is one of the longest escalators in the EU. At 87 meters, this escalator takes 2 minutes and 21 seconds to ascend, 2 minutes and 19 seconds to descend. The area is worth a visit, too. Many quaint little shops to explore. To sum up, if you are staying a few days, my advice is to get the 1-day or 3-day pass. If you are going to pay as you go, be sure to have some Czech change. Don’t forget to stamp the ticket (only one time) and do not lose it. The transportation system in Prague is efficient, clean, and the buses and trams run 24 hours a day. Getting around Prague should now be a bit easier for you. Many of our tours use the transportation system at least for a short time and your guides will answer any questions you may have about it. Christmas Markets Combo Tour: Prague + Vienna! Starting at €91.00 | December 5th - December 23rd | Select Your Date & Time! Christmas markets hold a special place in Europeans’ hearts. Maybe it’s the Old City lit up by lamplight and Christmas lights, and the wooden stands showcasing handmade goods and homemade goodies.